The Caulfield Sprint is a Group 2 race contested at Caulfield Racecourse on Caulfield Cup Day in mid-October each Melbourne Spring Racing Carnival. Run over a short distance of 1000m the open handicap is held at the same Saturday meeting as the Group 1 $3 million Caulfield Cup (2400m) and along with the Group 2 Tristarc Stakes (1400m) is the major support act on the card. Offering $200,000 in prize money the Caulfield Sprint is a good lead-up for runners looking to back-up in tougher spring sprints during the carnival including the following weekend’s Group 1 Manikato Stakes (1200m) at Moonee Valley and the Group 1 Darley Classic (1200m) at Flemington on the first Saturday in November. The last horse to complete the Caulfield Sprint – Manikato Stakes double was Sepoy (2011) when the latter was run before the Caulfield Sprint, while the Caulfield Sprint – Darley Classic double hasn’t been achieved since Rubitano (2002). The latest edition of the Caulfield Sprint took place on Saturday October 20, 2018. Caulfield Sprint odds are led each season by proven short-distance performers with winning form over 1000m – 1200m, betting opening at bookmakers around the country once the final field is released the Wednesday before Caulfield Cup Day. Previous experience the Melbourne way of going in Group company, a good inside barrier draw and a top three run last time out also help a horse to move higher up the Caulfield Sprint betting markets. Single and double-figure chances have recent winning form when in 2015 Lumosty ($4.60) and Éclair Choice ($26) ran a dead heat for first. Prior to that however the other most recent horse over $10 in betting to win the Caulfield Sprint was Biscayne Bay ($10 in 2006). In 2017 the Caulfield Sprint favourite Snitty Kitty was able to salute for the punters. The updated Caulfield Sprint 2018 betting odds and links to our Group 2 Caulfield Sprint markets this Caulfield Cup Day will be available below the week of the race so stay tuned for access to the top spring racing offers. Good Caulfield Sprint tips include looking for runners that won’t find the 1100m short sprint too sharp, previous Group 1 / 2 performers coming off good spring form in Melbourne and those drawn close to the fence. Favourites and runners under $10 in Caulfield Sprint betting also have a gun record in the race over the past decade so backing the top fancies in the markets is another tip to take to the bookies. Our Ladbrokes’ insider Caulfield Sprint 2018 betting tips and Group 2 Caulfield Sprint racing selections will be detailed below the week of the race so stay tuned for the sprinters to back and sack this spring. The Caulfield Sprint field attracts a host of in-form short-distance specialists looking to back-up in an upcoming Group 1 feature in Melbourne during the spring. Runners come off a variety of different lead-ups into the Caulfield Sprint field including Moonee Valley’s Group 1 Moir Stakes (1000m) held at the start of October. In 2015 Ball Of Muscle ran second in the Moir Stakes and third in the Caulfield Sprint. 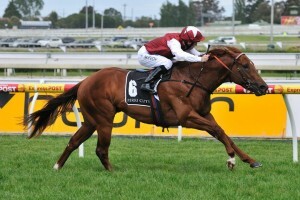 Caulfield Sprint winner Sepoy (2011) went on to win the Coolmore Stud Stakes later that spring. Photo Credit: Taron Clarke. Another possible lead-up is the Group 2 Gilgai Stakes (1200m) held at Flemington on Turnbull Stakes Day a fortnight earlier, which last produced a winner with Spirit Of Boom (2nd) in 2013. Two year’s earlier the Caulfield Sprint winner Sepoy (2011) came off a win in the Group 1 Manikato Stakes (1200m) at Moonee Valley. That same year the Caulfield Sprint runner-up Curtana came off a Gilgai Stakes fourth and went on to run fourth in the Darley Classic (then the Patinack Classic) two starts later. The 2011 Caulfield Sprint third placegetter Mid Summer Music also ran third in the Darley Classic behind Black Caviar. Caulfield Sprint graduates often back-up on Victoria Derby Day in the Group 2 Salinger Stakes (1200m), the double last achieved by Éclair Choice (2015) who ran a dead-heat with Lumosty in the first leg. The Caulfield Sprint nominations close the Monday before the race runs on the Saturday followed by the final field and barriers out on the Wednesday. The official Caulfield Sprint 2018 Final Field & Barriers will be announced below the Wednesday leading-up to Caulfield Cup Day so bookmark this page to view what sprinters make the cut in the short-distance showdown. The Caulfield Sprint 2018 Nominations are taken by Racing Victoria on the Monday of race week and will be provided below for punters as soon as released. The Caulfield Sprint form guide provides punters with crucial information and statistics like the track / distance record of the runners in the race along with their jockeys, trainers and barriers. Mares have a good recent record in the race with Snitty Kitty the latest to salute in 2017, following on from Lumosty (=1st in 2015) and Miracles Of Life (=1st in 2014), so looking for the in-form female gallopers on the Caulfield Sprint form guide can prove profitable for punters. Caulfield Sprint form has stacked up in better spring races a number of times in recent times including in 2011 when Sepoy won the Group 1 Coolmore Stud Stakes (1200m) next start as a three-year-old at Flemington during the Melbourne Cup Carnival. The last Caulfield Sprint winner to run top three in the Darley Classic in the same year was Sunburnt Land (3rd in 2008). Incredibly there have been two recent dead-heats in the Caulfield Sprint results. In 2015 Lumosty and Éclair Choice were tied for first place just 12 months after Miracles Of Life and Bel Sprinter were unable to be split on the line in the 2014 edition. Other notable recent Caulfield Sprint winners include Snitty Kitty (2017) who set a race record, Spirit Of boom (2013), Sepoy (2011) and Jet Spur (2005). The full Caulfield Sprint 2018 Results & Finishing Order will be provided below once the race is run and won on Saturday October 20, 2018.